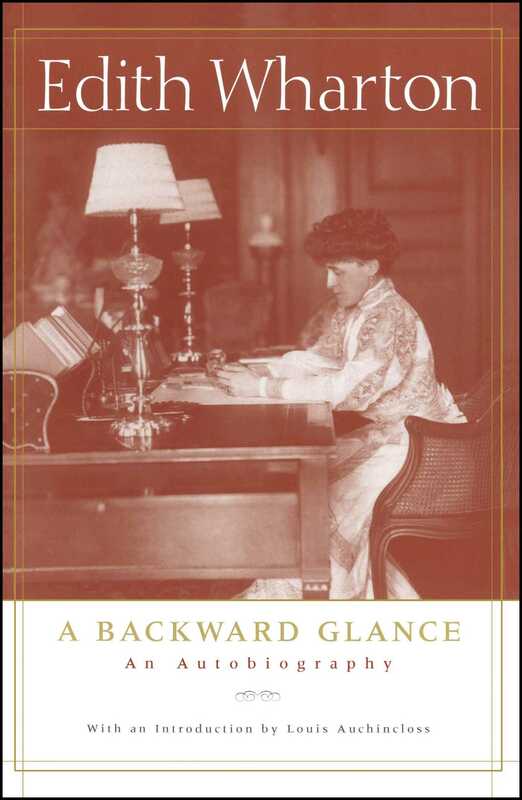 Edith Wharton, the first woman to win the Pulitzer Prize, vividly reflects on her public and private life in this stunning memoir. In his introduction to this edition, Louis Auchincloss calls the writing in A Backward Glance “as firm and crisp and lucid as in the best of her novels.” It is a memoir that will charm and fascinate all readers of Wharton’s fiction. Gute Gesellschaft hab ich gesehen; man nennt sie die gute Wenn sie zum kleinsten Gedicht nicht die Gelegenheit giebt. It was on a bright day of midwinter, in New York. The little girl who eventually became me, but as yet was neither me nor anybody else in particular, but merely a soft anonymous morsel of humanity -- this little girl, who bore my name, was going for a walk with her father. The episode is literally the first thing I can remember about her, and therefore I date the birth of her identity from that day. She had been put into her warmest coat, and into a new and very pretty bonnet, which she had surveyed in the glass with considerable satisfaction. The bonnet (I can see it today) was of white satin, patterned with a pink and green plaid in raised velvet. It was all drawn into close gathers, with a bavolet in the neck to keep out the cold, and thick ruffles of silky blonde lace under the brim in front. As the air was very cold a gossamer veil of the finest white Shetland wool was drawn about the bonnet and hung down over the wearer's round red cheeks like the white paper filigree over a Valentine; and her hands were encased in white woollen mittens. One of them lay in the large safe hollow of her father's bare hand; her tall handsome father, who was so warm-blooded that in the coldest weather he always went out without gloves, and whose head, with its ruddy complexion and intensely blue eyes, was so far aloft that when she walked beside him she was too near to see his face. It was always an event in the little girl's life to take a walk with her father, and more particularly so today, because she had on her new winter bonnet, which was so beautiful (and so becoming) that for the first time she woke to the importance of dress, and of herself as a subject for adornment -- so that I may date from that hour the birth of the conscious and feminine me in the little girl's vague soul. The little girl and her father walked up Fifth Avenue: the old Fifth Avenue with its double line of low brown-stone houses, of a desperate uniformity of style, broken only -- and surprisingly -- by two equally unexpected features: the fenced-in plot of ground where the old Miss Kennedys' cows were pastured, and the truncated Egyptian pyramid which so strangely served as a reservoir for New York's water supply. The Fifth Avenue of that day was a placid and uneventful thoroughfare, along which genteel landaus, broughams and victorias, and more countrified vehicles of the "carryall" and "surrey" type, moved up and down at decent intervals and a decorous pace. On Sundays after church the fashionable of various denominations paraded there on foot, in gathered satin bonnets and tall hats; but at other times it presented long stretches of empty pavement, so that the little girl, advancing at her father's side was able to see at a considerable distance the approach of another pair of legs, not as long but considerably stockier than her father's. The little girl was so very little that she never got much higher than the knees in her survey of grown-up people, and would not have known, if her father had not told her, that the approaching legs belonged to his cousin Henry. The news was very interesting, because in attendance on Cousin Henry was a small person, no bigger than herself, who must obviously be Cousin Henry's little boy Daniel, and therefore somehow belong to the little girl. So when the tall legs and the stocky ones halted for a talk, which took place somewhere high up in the air, and the small Daniel and Edith found themselves face to face close to the pavement, the little girl peered with interest at the little boy through the white woollen mist over her face. The little boy, who was very round and rosy, looked back with equal interest; and suddenly he put out a chubby hand, lifted the little girl's veil, and boldly planted a kiss on her cheek. It was the first time -- and the little girl found it very pleasant. This is my earliest definite memory of anything happening to me; and it will be seen that I was wakened to conscious life by the two tremendous forces of love and vanity. It may have been just after this memorable day -- at any rate it was nearly at the same time -- that a snowy-headed old gentleman with a red face and a spun-sugar moustache and imperial gave me a white Spitz puppy which looked as if its coat had been woven out of the donor's luxuriant locks. The old gentleman, in whose veins ran the purest blood of Dutch Colonial New York, was called Mr. Lydig Suydam, and I should like his name to survive till this page has crumbled, for with his gift a new life began for me. The owning of my first dog made me into a conscious sentient person, fiercely possessive, anxiously watchful, and woke in me that long ache of pity for animals, and for all inarticulate beings, which nothing has ever stilled. How I loved that first "Foxy" of mine, how I cherished and yearned over and understood him! And how quickly he relegated all dolls and other inanimate toys to the region of my everlasting indifference! The readers (and I should doubtless have been among them) who twenty years ago would have smiled at the idea that time could transform a group of bourgeois colonials and their republican descendants into a sort of social aristocracy, are now better able to measure the formative value of nearly three hundred years of social observance: the concerted living up to long-established standards of honour and conduct, of education and manners. The value of duration is slowly asserting itself against the welter of change, and sociologists without a drop of American blood in them have been the first to recognize what the traditions of three centuries have contributed to the moral wealth of our country. Even negatively, these traditions have acquired, with the passing of time, an unsuspected value. When I was young it used to seem to me that the group in which I grew up was like an empty vessel into which no new wine would ever again be poured. Now I see that one of its uses lay in preserving a few drops of an old vintage too rare to be savoured by a youthful palate; and I should like to atone for my unappreciativeness by trying to revive that faint fragrance. If any one had suggested to me, before 1914, to write my reminiscences, I should have answered that my life had been too uneventful to be worth recording. Indeed, I had never even thought of recording it for my own amusement, and the fact that until 1918 I never kept even the briefest of diaries has greatly hampered this tardy reconstruction. Not until the successive upheavals which culminated in the catastrophe of 1914 had "cut all likeness from the name" of my old New York, did I begin to see its pathetic picturesqueness. The first change came in the 'eighties, with the earliest detachment of big money:makers from the West, soon to be followed by the lords of Pittsburgh. But their infiltration did not greatly affect old manners and customs, since the dearest ambition of the newcomers was to assimilate existing traditions. Social life, with us as in the rest of the world, went on with hardly perceptible changes till the war abruptly tore down the old hame-work, and what had seemed unalterable rules of conduct became of a sudden observances as quaintly arbitrary as the domestic rites of the Pharaohs. Between the point of view of my Huguenot great-great-grandfather, who came from the French Palatinate to participate in the founding of New Rochelle, and my own father, who died in 1882, there were fewer differences than between my father and the post-war generation of Americans. That I was born into a world in which telephones, motors, electric light, central heating (except by hot-air furnaces), X-rays, cinemas, radium, aeroplanes and wireless telegraphy were not only unknown but still mostly unforeseen, may seem the most striking difference between then and now; but the really vital change is that, in my youth, the Americans of the original States, who in moments of crisis still shaped the national point of view, were the heirs of an old tradition of European culture which the country has now totally rejected. This rejection (which Mr. Walter Lippmann regards as the chief cause of the country's present moral impoverishment) has opened a gulf between those days and these. The compact world of my youth has receded into a past from which it can only be dug up in bits by the assiduous relic-hunter; and its smallest fragments begin to be worth collecting and putting together before the last of those who knew the live structure are swept away with it. Once, when I was about fifteen, my parents took me to Annapolis for the graduating ceremonies of the Naval Academy. In my infancy I had travelled extensively on the farther side of the globe, and it was thought high time that I should begin to see something of my own half. I recall with delight the charming old Academic buildings grouped about turf and trees, and the smartness of the cadets (among whom were some of my young friends) in their dress uniforms; and thrilling memories of speeches, marchings, military music and strawberry ice, flutter pleasingly about the scene. On the way back we stopped in Baltimore and Washington; but neither city offered much to youthful eyes formed by the spectacle of Rome and Paris. Washington, in the days before Charles McKim had seen its possibilities, and resolved to develop them on Major L'Enfant's lines, was in truth a doleful desert; and it was a weary and bored little girl who trailed after her parents through the echoing emptiness of the Capitol, and at last into the famous Rotunda with its paintings of Revolutionary victories. Trumbull was little thought of as a painter in those days (Munkacsky would doubtless have been preferred to him), and when one great panel after another was pointed out to me, and I was led up first to the "Surrender of Burgoyne" and then to the "Surrender of Cornwallis", and told: "There's your great-grandfather," the tall thin young man in the sober uniform of a general of artillery, leaning against a cannon in the foreground of one picture, in the other galloping across the battlefield, impressed me much less than the beautiful youths to whom I had just said goodbye at Annapolis. If anything, I was vaguely sorry to have any one belonging to me represented in those stiff old-fashioned pictures, so visibly inferior to the battle-scenes of Horace Vernet and Detaille. I remember feeling no curiosity about my great-grandfather, and my parents said nothing to rouse my interest in him. The New Yorker of that day was singularly, inexplicably indifferent to his descent, and my father and mother were no exception to the rule. It was many years later that I began to suspect that Trumbull was very nearly a great painter, and my great-grandfather Stevens very nearly a great man; but by that time all who had known him, and could have spoken of him familiarly, had long been dead, and he was no more than a museum-piece to me. It is a pity, for he must have been worth knowing, even at second hand. On both sides our colonial ancestry goes back for nearly three hundred years, and on both sides the colonists in question seem to have been identified since early days with New York, though my earliest Stevens forbears went first to Massachusetts. Some of the first Stevens's grandsons, however, probably not being of the stripe of religious fanatic or political reformer to breathe easily in that passionate province, transferred their activities to the easier-going New York, where people seem from the outset to have been more interested in making money and acquiring property than in Predestination and witch-burning. I have always wondered if those old New Yorkers did not owe their greater suavity and tolerance to the fact that the Church of England (so little changed under its later name of Episcopal Church of America) provided from the first their prevalent form of worship. May not the matchless beauty of an ancient rite have protected our ancestors from what Huxley called the "fissiparous tendency of the Protestant sects", sparing them sanguinary wrangles over uncomprehended points of doctrine, and all those extravagances of self-constituted prophets and evangelists which rent and harrowed New England? Milder manners, a greater love of ease, and a franker interest in money-making and good food, certainly distinguished the colonial New Yorkers from the conscience-searching children of the "Mayflower". Apart from some of the old Dutch colonial families, who continued to follow the "Dutch Reformed" rite, the New York of my youth was distinctively Episcopalian; and to this happy chance I owe my early saturation with the noble cadences of the Book of Common Prayer, and my reverence for an ordered ritual in which the officiant's personality is strictly subordinated to the rite he performs. Colonial New York was mostly composed of merchants and bankers; my own ancestors were mainly merchant ship-owners, and my great-grandmother Stevens's wedding-dress, a gauzy Directoire web of embroidered "India mull", was made for her in India and brought to New York on one of her father's merchantmen. My mother, who had a hearty contempt for the tardy discovery of aristocratic genealogies, always said that old New York was composed of Dutch and British middle-class families, and that only four or five could show a pedigree leading back to the aristocracy of their ancestral country. These, if I remember rightly, were the Duets, the Livingstons, the Rutherfurds, the de Grasses and the Van Rensselaers (descendants, these latter, of the original Dutch "Patroon"). I name here only families settled in colonial New York; others, from the southern states, but well known in New York -- such as the Fairfaxes, Carys, Calverts and Whartons -- should be added if the list included the other colonies. My own ancestry, as far as I know, was purely middle-class; though my family belonged to the same group as this little aristocratic nucleus I do not think there was any blood-relationship with it. The Schermerhorns, Joneses, Pendletons, on my father's side, the Stevenses, Ledyards, Rhinelanders on my mother's, the Gallatins on both, seem all to have belonged to the same prosperous class of merchants, bankers and lawyers. It was a society from which all dealers in retail business were excluded as a matter of course. The man who "kept a shop" was more rigorously shut out of polite society in the original Thirteen States than in post-revolutionary France -- witness the surprise (and amusement) of the Paris solicitor, Moreau de St Méry, who, fleeing from the Terror, earned his living by keeping a bookshop in Philadelphia, and for this reason, though his shop was the meeting-place of the most blue-blooded of his fellow émigrés, and Talleyrand and the Marquis de la Tour du Pin were among his intimates, yet could not be invited to the ball given for Washington's inauguration. So little did the Revolution revolutionize a society at once middle-class and provincial that no retail dealer, no matter how palatial his shop-front or how tempting his millions, was received in New York society until long after I was grown up. My great-grandfather, the Major-General Ebenezer Stevens of the Rotunda, seems to have been the only marked figure among my forbears. He was born in Boston in 1751 and, having a pronounced tendency to mechanical pursuits, was naturally drafted into the artillery at the Revolution. He served in Lieutenant Adino Paddock's artillery company, and took part in the "Boston tea-party", where, as he told one of his sons, "none of the party was painted as Indians, nor, that I know of, disguised; though," (he adds a trifle casuistically) "some of them stopped at a paint-shop on the way and daubed their faces with paint." Thereafter he is heard of as a house-builder and contractor in Rhode Island; but at the news of the battle of Lexington he abandoned his business and began the raising and organizing of artillery companies. He was a first lieutenant in the Rhode Island artillery, then in that of Massachusetts, and in 1776 was transferred as captain to the regiment besieging Quebec. At Ticonderoga, Stillwater and Saratoga he commanded a division of artillery, and it was he who directed the operations leading to General Burgoyne's surrender. For these feats he was specially commended by Generals Knox, Gates and Schuyler, and in 1778 he was in command of the entire artillery service of the northern department. Under Lafayette he took part in the expedition which ended in the defeat of Lord Cornwallis; his skilful manoeuvres are said to have broken the English blockade at Annapolis, and when the English evacuated New York he was among the first to enter the city. The war over, he declined further military advancement and returned to civil life. His services, however, were still frequently required, and in 1812 he was put in command of the New York Brigade of artillery. One of the forts built at this time for the defence of New York harbour was called Fort Stevens, in his honour, and after the laying of the foundation stone he "gave the party a dinner at his country seat, 'Mount Buonaparte'", which he had named after the hero who restored order in France. My great-grandfather next became an East-India merchant, and carried on a large and successful trade with foreign ports. The United States War Department still entrusted him with important private missions; he was a confidential agent of both the French and English governments, and at the same time took a leading part in the municipal business of New York, and served on numerous commissions dealing with public affairs. He divided his year between his New York house in Warren Street, and Mount Buonaparte, the country place on Long Island created by the fortune he had made as a merchant; but when his hero dropped the u from his name and became Emperor, my scandalized great-grandfather, irrevocably committed to the Republican idea, indignantly re-named his place "The Mount". It stood, as its name suggests, on a terraced height in what is now the dreary waste of Astoria, and my mother could remember the stately colonnaded orangery, and the big orange-trees in tubs that were set out every summer on the upper terrace. But in her day the classical mantelpieces imported from Italy, with designs in white marble relieved against red or green, had already been torn out and replaced by black marble arches and ugly grates, and she recalled seeing the old mantelpieces stacked away in the stables. In his Bonapartist days General Stevens must have imported a good deal of Empire furniture from Paris, and one relic, a pair of fine gilt andirons crowned with Napoleonic eagles, has descended to his distant great-grand-daughter; but much was doubtless discarded when-the mantelpieces went, and the stuffy day of Regency upholstery set in. If I have dwelt too long on the career of this model citizen it is because of a secret partiality for him -- for his stern high-nosed good looks, his gallantry in war, his love of luxury, his tireless commercial activities. I like above all the abounding energy, the swift adaptability and the joie de vivre which hurried him from one adventure to another, with war, commerce and domesticity (he had two wives and fourteen children) all carried on to the same heroic tune. But perhaps I feel nearest to him when I look at my eagle andirons, and think of the exquisite polychrome mantels that he found the time to bring all the way from Italy, to keep company with the orange-trees on his terrace. In his delightful book on Walter Scott Mr. John Buchan, excusing Scott's inability to create a lifelike woman of his own class, says that, after all, to the men of his generation, gentlewomen were "a toast" and little else. Nothing could be truer. Child-bearing was their task, fine needlework their recreation, being respected their privilege. Only in aristocratic society, and in the most sophisticated capitals of Europe, had they added to this repertory a good many private distractions. In the upper middle class "the ladies, God bless 'em", sums it up. And so it happens that I know less than nothing of the particular virtues, gifts and modest accomplishments of the young women with pearls in their looped hair or cambric ruffs round their slim necks, who prepared the way for my generation. A few shreds of anecdote, no more than the faded flowers between the leaves of a great-grandmother's Bible, are all that remain to me. Of my lovely great-grandmother Rhinelander (Mary Robart) I know only that she was of French descent, as her spirited profile declares, and properly jealous of her rights; for if she chanced to drive to New York in her yellow coach with its fringed hammer-cloth at the same hour when her daughter-in-law, from lower down the East River, was following the same road, the latter's carriage had to take the old lady's dust all the way, even though her horses were faster and her errand might be more urgent. I may add that once, several years after my marriage, a new coachman, who did not know my mother's carriage by sight, accidentally drove me past it on the fashionable Ocean Drive at Newport, and that I had to hasten the next morning to apologize to my mother, whose only comment was, when I explained that the coachman could not have known the offence he was committing: "You might have told him". One of my great-grandmothers, Lucretia Ledyard (the second wife of General Stevens), lost her "handsome sable cloak" one day when she was driving out General Washington in her sleigh, while on another occasion, when she was walking on the Battery in 1812, the gentleman who was with her, glancing seaward, suddenly exclaimed: "My God, madam, there are the British!" Meagre relics of the past; and when it comes to the next generation, that of my own grandparents, I am little better informed. My maternal grandfather Rhinelander, son of the proud dame of the yellow coach, married Mary Stevens, daughter of the General and his dusky handsome Ledyard wife. The young pair had four children, and then my grandfather died, when he was little more than thirty. He too was handsome, with frank blue eyes and a wide intelligent brow. My mother said he "loved reading", and that particular drop of his blood must have descended to my veins, for I know of no other bookworm in the family. His young widow and her children continued to live at the country place at Hell Gate, lived there, in fact, from motives of economy, in winter as well as summer while the children were young; for my grandmother, whose property was left to the management of her husband's eldest brother, remained poor though her brother-in-law grew rich. The children, however, were carefully educated by English governesses and tutors; and to one of the latter is owing a charming study of the view across Hell Gate to Long Island, taken from my grandmother's lawn. The little girls were taught needle-work, music, drawing and "the languages" (their Italian teacher was Professor Foresti, a distinguished fugitive from the Austrian political prisons). In winter their "best dresses" were low-necked and short-sleeved frocks, of pea-green merino, with gray beaver hats trimmed with tartan ribbons, white cotton stockings and heelless prunella slippers. When they walked in the snow hand-knitted woollen stockings were drawn over this frail footgear, and woollen shawls wrapped about their poor bare shoulders. They suffered, like all young ladies of their day, from chilblains and excruciating sick-headaches, yet all lived to a vigorous old age. When the eldest (my mother) "came out", she wore a home-made gown of white tarlatan, looped up with red and white camellias from the greenhouse, and her mother's old white satin slippers; and her feet being of a different shape from grandmamma's, she suffered martyrdom, and never ceased to resent the indignity inflicted on her, and the impediment to her dancing, the more so as her younger sisters, who were prettier and probably more indulged, were given new slippers when their turn came. The girls appear to have had their horses (in that almost road-less day Americans still went everywhere in the saddle), and my mother, whose memory for the details of dress was inexhaustible, told me that she wore a beaver hat with a drooping ostrich plume, and a green veil to protect her complexion, and that from motives of modesty riding-habits were cut to trail on the ground, so that it was almost impossible to mount unassisted. A little lower down the Sound (on the actual site of East Eighty-first Street) stood my grandfather Jones's pretty country house with classic pilasters and balustraded roof. A print in my possession shows a low-studded log-cabin adjoining it under the elms, described as the aboriginal Jones habitation; but it was more probably the slaves' quarter. In this pleasant house lived a young man of twenty, handsome, simple and kind, who was madly in love with Lucretia, the eldest of the "poor Rhinelander" girls. George Frederic's parents thought him too young to marry; perhaps they had other ambitions for him; they bade him break off his attentions to Miss Rhinelander of Hell Gate. But George Frederic was the owner of a rowing-boat. His stern papa, perhaps on account of the proximity of the beloved, refused to give him a sailing-craft, though every youth of the day had his "cat-boat", and the smiling expanse of the Sound was flecked with the coming and going of white wings. But George was not to be thwarted. He contrived to turn an oar into a mast; he stole down before dawn, his bed-quilt under his arm, rigged it to the oar in guise of a sail, and flying over the waters of the Sound hurried to his lady's feet across the lawn depicted in the tutor's painting. His devotion at last overcame the paternal opposition, and George and "Lou" were married when they were respectively twenty-one and nineteen. My grandfather was rich, and must have made his sons a generous allowance; for the young couple, after an adventurous honeymoon in Cuba (of which my father kept a conscientious record, full of drives in volantes and visits to fashionable plantations) set up a house of their own in Gramercy Park, then just within the built-on limits of New York, and Mrs. George Frederic took her place among the most elegant young married women of her day. At last the home-made tarlatans and the inherited satin shoes were avenged, and there began a long career of hospitality at home and travels abroad. My father, as a boy, had been to Europe with his father on one of the last of the great sailing passenger-ships; and he often told me of the delights of that crossing, on a yacht-like vessel with few passengers and spacious airy cabins, as compared with subsequent voyages on the cramped foul-smelling steamers that superseded the sailing ships. A year or so after the birth of my eldest brother my parents went abroad on a long tour. The new railways were beginning to transform continental travel, and after driving by diligence from Calais to Amiens my family journeyed thence by rail to Paris. Later they took train from Paris to Brussels, a day or two after the inauguration of this line; and my father notes in his diary: "We were told to be at the station at one o'clock, and by Jour we were actually off." By various means of conveyance the young couple with their infant son pursued their way through France, Belgium, Germany and Italy. They met other young New Yorkers of fashion, also on their travels, and would have had a merry time of it had not little Freddy's youthful ailments so frequently altered their plans -- sometimes to a degree so disturbing that the patient young father (of twenty-three) confides to his diary how "awful a thing it is to travel in Europe with an infant of twenty months". In spite of Freddy they saw many cities and countries, and on February 24, 1848, toward the hour of noon, incidentally witnessed, from the balcony of their hotel in the rue de Rivoli, the flight of Louis Philippe and Queen Marie Amélie across the Tuileries gardens. Though my mother often described this scene to me, I suspect that the study of the Paris fashions made a more vivid impression on her than the fall of monarchies, The humiliation of the pea-green merino and the maternal slippers led to a good many extravagances; among them there is the white satin bonnet trimmed with white marabout and crystal drops in which the bride made her wedding visits, and a "capeline" of gorge de pigeon taffetas with a wreath of flowers in shiny brown kid, which was one of the triumphs of her Paris shopping. She had a beautiful carriage, and her sloping shoulders and slim waist were becomingly set off by the wonderful gowns brought home from that first visit to the capital of fashion. All this happened years before I was born; but the tradition of elegance was never abandoned, and when we finally returned to live in New York (in 1872) I shared the excitement caused by the annual arrival of the "trunk from Paris", and the enchantment of seeing one resplendent dress after another shaken out of its tissue-paper. Once, when I was a small child, my mother's younger sister, my beautiful and serious-minded Aunt Mary Newbold, asked me, with edifying interest: "What would you like to be when you grow up?" and on my replying in all good faith, and with a dutiful air: "The best-dressed woman in New York," she uttered the horrified cry: "Oh, don't say that, darling!" to which I could only rejoin in wonder: "But, Auntie, you know Mamma is." When my grandfather died my father came into an independent fortune; but even before that my father and uncles seem to have had allowances permitting them to lead a life of leisure and amiable hospitality. The customs of the day were simple, and in my father's set the chief diversions were sea-fishing, boat-racing and wild-fowl shooting. There were no clubs as yet in New York, and my mother, whose view of life was incurably prosaic, always said that this accounted for the early marriages, as the young men of that day "had nowhere else to go". The young married couples, Langdons, Hones, Newbolds, Edgars, Joneses, Gallatins, etc., entertained each other a good deal, and my mother's sloping shoulders were often displayed above the elegant fringed and ruffled "berthas" of her Parisian dinner gowns. The amusing diary of Mr. Philip Hone gives a good idea of the simple but incessant exchange of hospitality between the young people who ruled New York society before the Civil War. My readers, by this time, may be wondering what were the particular merits, private or civic, of these amiable persons. Their lives, as one looks back, certainly seem lacking in relief; but I believe their value lay in upholding two standards of importance in any community, that of education and good manners, and of scrupulous probity in business and private affairs. New York has always been a commercial community, and in my infancy the merits and defects of its citizens were those of a mercantile middle class. The first duty of such a class was to maintain a strict standard of uprightness in affairs; and the gentlemen of my father's day did maintain it, whether in the law, in banking, shipping or wholesale commercial enterprises. I well remember the horror excited by any irregularity in affairs, and the relentless social ostracism inflicted on the families of those who lapsed from professional or business integrity. In one case, where two or three men of high social standing were involved in a discreditable bank failure, their families were made to suffer to a degree that would seem merciless to our modern judgment. But perhaps the New Yorkers of that day were unconsciously trying to atone for their culpable neglect of state and national politics, from which they had long disdainfully held aloof, by upholding the sternest principles of business probity, and inflicting the severest social penalties on whoever lapsed from them. At any rate I should say that the qualities justifying the existence of our old society were social amenity and financial incorruptibility; and we have travelled far enough from both to begin to estimate their value. The weakness of the social structure of my parents' day was a blind dread of innovation, an instinctive shrinking from responsibility. In 1824 (or thereabouts) a group of New York gentlemen who were appointed to examine various plans for the proposed laying-out of the city, and whose private sympathies were notoriously anti-Jeffersonian and undemocratic, decided against reproducing the beautiful system of squares, circles and radiating avenues which Major L'Enfant, the brilliant French engineer, had designed for Washington, because it was thought "undemocratic" for citizens of the new republic to own building-plots which were not all of exactly the same shape, size -- and value! This naïf document, shown to me by Robert Minturn, a descendant of a member of the original committee, and doubtless often since published, typified the prudent attitude of a society of prosperous business men who have no desire to row against the current. A little world so well-ordered and well-to-do does not often produce either eagles or fanatics, and both seem to have been conspicuously absent from the circle in which my forbears moved. In old-established and powerful societies originality of character is smiled at, and even encouraged to assert itself; but conformity is the bane of middle-class communities, and as far as I can recall, only two of my relations stepped out of the strait path of the usual. One was a mild and inoffensive old bachelor cousin, very small and frail, and reputed of immense wealth and morbid miserliness, who built himself a fine house in his youth, and lived in it for fifty or sixty years, in a state of negativeness and insignificance which made him proverbial even in our conforming class -- and then, in his last years (so we children were told) sat on a marble shelf, and thought he was a bust of Napoleon. Cousin Edmund's final illusion was not without pathos, but as a source of inspiration to my childish fancy he was a poor thing compared with George Alfred. George Alfred was another cousin, but one whom I had never seen, and could never hope to see, because years before he had -- vanished. Vanished, that is, out of society, out of respectability, out of the safe daylight world of "nice people" and reputable doings. Before naming George Alfred my mother altered her expression and lowered her voice. Thank heaven she was not responsible for him -- he belonged to my father's side of the family! But they too had long since washed their hands of George Alfred -- had ceased even to be aware of his existence. If my mother pronounced his name it was solely, I believe, out of malice, out of the child's naughty desire to evoke some nursery hobgoblin by muttering a dark incantation like Eena Meena Mina Mo, and then darting away with affrighted backward looks to see if there is anything there. My mother always darted away from George Alfred's name after pronouncing it, and it was not until I was grown up, and had acquired greater courage and persistency, that one day I drove her to the wall by suddenly asking: "But, Mamma, what did he do?" "Some woman" -- my mother muttered; and no one accustomed to the innocuous word as now used can imagine the shades of disapproval, scorn and yet excited curiosity, that "some" could then connote on the lips of virtue. George Alfred -- and some woman! Who was she? From what heights had she fallen with him, to what depths dragged him down? For in those simple days it was always a case of "the woman tempted me". To her respectable sisters her culpability was as certain in advance as Predestination to the Calvinist. But I was not fated to know more -- thank heaven I was not! For our shadowy Paolo and Francesca, circling together on the "accursèd air", somewhere outside the safe boundaries of our old New York, gave me, I verily believe, my earliest glimpse of the poetry that Goethe missed in the respectable world of the Hirschgraben, and that my ancestors assuredly failed to find, or to create, between the Battery and Union Square. The vision of poor featureless unknown Alfred and his siren, lurking in some cranny of my imagination, hinted at regions perilous, dark and yet lit with mysterious fires, just outside the world of copy-book axioms, and the old obediences that were in my blood; and the hint was useful -- for a novelist. Copyright &copy; 1933, 1934 by The Curtis Publishing Co.